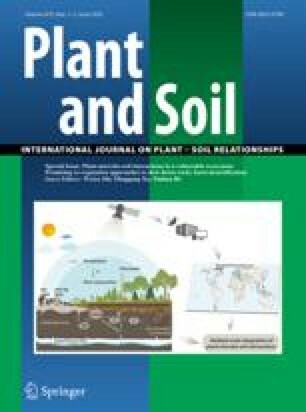 This study examined how the availability of inorganic nitrogen (N) modified the anatomical characteristics of white spruce (Picea glauca (Moench) Voss) roots related to their hydraulic properties. Seedlings were grown for one growing season in 4 L capacity pots filled with sand under one of three N levels: low (10 ppm), medium (50 ppm) and high (125 ppm). First order lateral roots with intact tips were sampled from dormant seedlings in October. Root segments were collected from 4, 10, and 14 cm distances above the root tip for fixation and sectioning and for maceration. Additional specimens were collected from the 4 and 14 cm distances for maceration and scanning electron microscopy of xylem pits. Root diameter and surface area occupied by the xylem in root cross sections increased basipetally in all treatments but exceptions were found. Higher N-levels significantly increased root diameter and surface area occupied by the xylem. In the two higher N treatments secondary root development was more advanced near the root tip than in the low N treatment. There was a strong positive correlation between root diameter and cross-sectional root area occupied by the xylem (30–50% of the root cross section) but not in portions with little secondary development. Non-conducting space within the xylem occupied 10–13% of its cross-sectional surface. Tracheids of the primary xylem were larger, had larger lumens but thinner cell walls than those of the secondary xylem. Low N treatment seedling tracheids had smaller total cross-sectional area, less lumen, and less cell wall surface area than the two other N treatments. Tracheid diameter means were between 19–20 μm in the high and medium N treatments, and 15.2 μm in the low N treatment. The range was 4.5–51.3 μm. Tracheid length was not significantly affected by N. The average tracheid was about 1000 μm long, and the range was 110–3530 μm. Pit-border diameters ranged between 4.1–20.6 μm (average 10–11 μm) and were not affected by the N treatment. Pit aperture diameters were within 0.62–10.2 μm range (average between 3–4 μm) and were also not significantly affected by the N treatment, although tracheids from the medium N-treatment roots tended to have larger apertures. The pit border diameter equals that of the margo while the aperture size should be similar to that of the torus of the pit membrane. If the capacity for axial water transport in spruce roots is affected by N, it would be by its impact on conduit diameter and, possibly on the pit-membrane pore sizes but not by changes to conduit length and to the size of the pit membrane surface area.